Samsung has announced its next generation Exynos processor that will be powering its next Galaxy smartphone. The Exynos 4 Quad comes with four Cortex A9 cores that can go up to 1.4GHz individually and is based on Samsung's 32nm HKMG fabrication process. The Exynos 4 Quad, also known as the Exynos 4212 (previously as the 4412), packs two times the number of cores as the Exynos 4 Dual (Exynos 4210) that you find in the Galaxy S II but due to the new 32nm processor is said to be 20 percent more efficient. The Exynos 4 Quad also uses power gating on all four cores along with frequency and voltage scaling for every core, which would help it cut down on power consumption when not in use. Samsung did not mention what GPU it will be using but it is likely to be the Mali 400-MP. 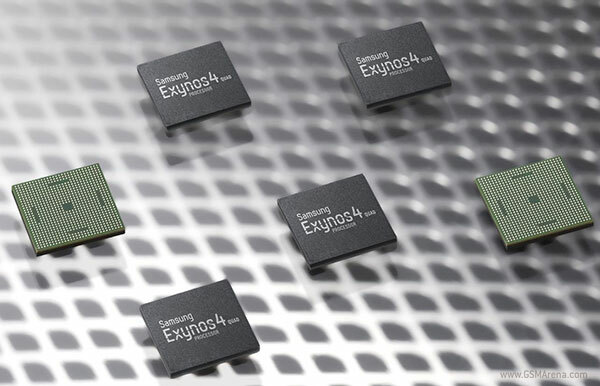 The new Exynos 4 Quad is said to be pin-to-pin compatible with the Exynos 4 Dual, which would allow hardware manufacturers to easily upgrade to the new chip. We will see how this new chip performs in comparison to the current chips when the next Galaxy device comes out. You can also get a glimpse of the next generation Exynos 5 Dual at the beginning of the video below. That's why i think Nvidia just needs to stick to what they do best the desktop/laptop PC GPU's they make. Since Nvidia makes the best GPU desktop/laptop PC processors hands down. Is the processor fully programmable?